Lao She (Chinese: 老舍; pinyin: Lǎo Shě, original name Shū Qìngchūn (舒庆春) (Sumuru in Manchu). (February 3, 1899 – August 24, 1966) was a notable Chinese writer. A novelist and dramatist, he was one of the most significant figures of twentieth century Chinese literature, and is perhaps best known for his novel Camel Xiangzi or Rickshaw Boy (駱駝祥子) and the play Teahouse (茶館). He was of Manchu ethnicity. Lao She was baptized at London Church in Gangwashi, Beijing in 1922. With the help of Reverend Robert Kenneth Evans and the Church, he went to the University of London and became a lecturer at the School of Oriental Studies. While he developed his understanding of English literature, Christianity, and Western culture, he also witnessed how Westerners viewed the Chinese people. He developed his zeal and passion for strengthening China and educating youth. Tragically, he was severely criticized and humiliated in public by the Red Guards under the Cultural Revolution, and this persecution led to his suicide. Yasushi Inoue, Tsutomu Murakami, Sawako Ariyoshi, and other famous Japanese writers published articles and held a series of memorial events in response to the end of his life. His name and honor was "rehabilitated" after the downfall of the Gang of Four. He was born in Beijing, to a poor family of the Sūmuru clan belonging to the Red Banner. His father, who was a guard soldier, died in a street battle with the Eight-Power Allied Forces in 1901. To support her family and Lao Shê's private tutoring, his mother did laundry. "During my childhood," Lao She later recalled, "I didn't need to hear stories about evil ogres eating children and so forth; the foreign devils my mother told me about were more barbaric and cruel than any fairy tale ogre with a huge mouth and great fangs. And fairy tales are only fairy tales, whereas my mother's stories were 100 percent factual, and they directly affected our whole family." In 1913, he was admitted to the Beijing Normal Third High School (currently Beijing Third High School), but had to leave after several months because of financial difficulties. In the same year, he was accepted into the Beijing Institute for Education, where he graduated in 1918. Between 1918 and 1924 he was involved as administrator and faculty member at a number of primary and secondary schools in Beijing and Tianjin. He was highly influenced by the May Fourth Movement (1919). He stated, "[The] May Fourth [Movement] gave me a new spirit and a new literary language. I am grateful to [The] May Fourth [Movement], as it allowed me to become a writer." In 1922, Lao She was baptized at London Christian Church in Gangwashi and became a Christian. He actively participated in social welfare activities and acquainted with Reverend Robert Kenneth Evans. Encounter with Christianity changed his value perspective and opened his eyes to the West. With the help of Rev. Evans and the Church, he went on to serve as lecturer in the Chinese section of the (then) School of Oriental Studies (now the School of Oriental and African Studies) at the University of London from 1924 to 1929. During his time in London, he absorbed a great deal of English literature and began his own writing. His later novel 二马 (Ma and Son) drew on these experiences. 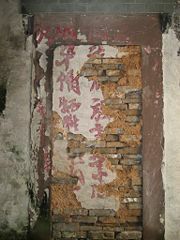 In London, he experienced and witnessed how the Chinese were viewed and treated by English people and other Westerners. While he developed his understanding of Christianity and its positive elements, he also developed a strong sense of the value of Chinese cultural traditions. His love for China and desire to build the country and educate youth grew during his stay in London. In the summer of 1929, he left Britain for Singapore, teaching at the Chinese High School (华侨中学). Between his return to China in the spring of 1930 until 1937, he taught at several universities, including Cheeloo University (齐鲁大学) and Shandong University (Qingdao). The outbreak of the second Sino-Japanese War (1937-1945) radically altered Lao She's views. Between the years 1937 and 1945 he wrote a number of plays, worked as a propagandist, and headed the All-China Anti-Japanese Writers Federation. After World War II Lao She published a gigantic novel in three parts, Sishi Tongtang (abridged translation The Yellow Storm). It dealt with life in Peking during the Japanese occupation of Manchuria. Between the years 1946 and 1949 Lao She lived in the United States on a cultural grant at the invitation of the Department of State. When the People's Republic of China was established in 1949, Lao She returned to China. Lao She was a member of the Cultural and Educational Committee in the Government Administration Council, a deputy to the National People's Congress, a member of the Standing Committee of the Chinese People's Political Consultative Conference, vice-chairman of the All-China Federation of Literature and Art and vice-chairman of the Union of Chinese Writers as well as chairman of the Beijing Federation of Literature and Art. Like thousands of other intellectuals in China, he experienced mistreatment in the Cultural Revolution of the mid-1960s. The Red Guards of the Cultural Revolution had attacked him as a counterrevolutionary. They paraded him through the streets and beat him in public. Greatly humiliated both mentally and physically, he committed suicide by drowning himself in a Beijing lake in 1966. His relatives were accused of implication in his "crimes" but continued to rescue his manuscripts after his death, hiding them in coal piles and a chimney and moving them from house to house. He was married to Hu Jieqing and they had four children, one son and three daughters. His first important novel, Luotuo Xiangzi (骆驼祥子, "Camel Xiangzi," widely known in the West as "Rickshaw Boy" or "Rickshaw"), was published in 1936. It describes the tragic life of a rickshaw puller in Beijing of the 1920s and is considered to be a classic of modern Chinese literature. The English version Rickshaw Boy became a US bestseller in 1945; it was an unauthorized translation that added a happy ending to the story. In 1982, the original version was made into a film of the same title. He was named a 'People's Artist' and a 'Great Master of Language'. His plays, such as Long Xugou (1951, Dragon Beard Ditch), became ideologically didactic, and did not reach the level of his former work. Shen Ruan written in 1960, on the sixtieth anniversary of the Boxer uprising, was a four-act play about the Boxers. 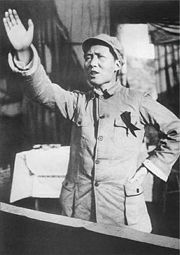 Lao She emphasized the anti-imperialistic zeal of the Boxers and the burning and killing carried out by the Allied Powers. During the Cultural Revolution, Lao She was publicly denounced and criticized, as a number of other writers and intellectuals. On October 24, 1966, Lao She was murdered or driven to suicide. His last novel, The Drum Singers (1952), was first published in English in the United States. His other important works include Si Shi Tong Tang (四世同堂, abridged translation The Yellow Storm, directly translated into "Four Generations under One Roof" 1944–1950), a novel describing the life of the Chinese people during the Japanese Occupation; Cat Country (猫城记) a satire which is sometimes seen as the first important Chinese science fiction novel, Cha Guan (茶馆, "Teahouse"), a play written in 1957; and Lao Zhang de Zhexue (老张的哲学, "The Philosophy of Old Zhang"), his first published novel, written in London (1926). Lao She's most frequently performed plays is Cha Guan (Teahouse), which was written in 1957. The events are set in the Beijing teahouse of Wang Lifa during three different periods: 1898 under the empire, the 1910s under the warlords, and around 1945 after W W II. "In the teahouses one could hear the most absurd stories," Lao She writes of the scene set in 1898, "such as how a in a certain place a huge spider had turned into a demon and was then struck by lightning. One could also come in contact with the strangest of views; for example, that foreign troops could be prevented from landing by building a Great Wall along the sea coast." In the story, Lao She follows the lives of Wang and his customers. Ambivalently Wang and his friends demonstrate the failure of their lives towards the end by a mock funeral, welcoming the new society. The teahouse is requisitioned as a club and Wang is offered a job as doorman - however, he has already hanged himself. - The Beijing People's Art Theatre performed the play in 1980 in West Germany and France during the three-hundredth anniversary of the Comédie-Française. Since the end of the Cultural Revolution, Lao She's works have been republished. In 1979, he was posthumously "rehabilitated" by the Communist Party. Several of his stories have been made into films, including This Life of Mine (1950, dir. by Shi Hui), Dragon Beard Ditch (1952, dir. by Xian Qun), Rickshaw Boy (1982, dir. by Zifeng Ling), The Teahouse (1982, dir. by Xie Tian), The Crescent Moon (1986, dir. by Huo Zhuang), The Drum Singers (1987, dir. by Tian Zhuangzhuang), and The Divorce. Tian Zhuangzhuang's film version of The Drum Singers (1987) was mostly shot on location in Sichuan. The Laoshe Tea House (老舍茶馆), a popular tourist attraction in Beijing that opened in 1988 and features regular performances of traditional music, is named for Lao She, but features primarily tourist-oriented attractions and nothing related to Lao She. Lao She. Mr. Ma and Son: A Sojourn in London. Beijing: Foreign Language Press, 2001. ISBN 9787119028972. Lao She, and Ching-ch'iu Kuo. The Quest for Love of Lao Lee. New York: Reynal & Hitchcock, 1948. Lao She, and Ida Pruitt. The Yellow Storm. New York: Harcourt, Brace, 1951. Lao She, and John Howard-Gibbon, translator. Teahouse: A Play in Three Acts. Beijing: Foreign Languages Press, 1980; Honolulu: University Press of the Pacific, 2001. ISBN 0898752612. Lao She, Evan King, and Cyrus Leroy Baldridge. Rickshaw Boy. New York: Reynal & Hitchcock, 1945. Lao She. Beneath the Red Banner. Borgo Press, 1998. ISBN 0809545039. Lao She. Cat Country: A Satirical Novel of China in the 1930s by Lao She. [Columbus]: Ohio State University Press, 1970. ISBN 9780814200131. Lao She. Dragon Beard Ditch; A Play in Three Acts. Peking: Foreign Languages Press, 1956. Lao She. Lao She. Nanjing, Jiangsu, China: Yilin Press, 1992. ISBN 9787805671628. Lao She. The Drum Singers. (1952); Joint Publishing Co., 1987, translated by Helena Kuo. Lao She. Camel Xiangzi. (Bilingual Series on Modern Chinese Literature) by Lao She and Shi Xiangzi, (translator). The Chinese University Press, 2005. ISBN 9629961970. Lao She. Crescent Moon and Other Stories. (Panda Books) China Books & Periodicals, 1985. ISBN 978-0835113342. ↑ "Lao Shê" in Modern Chinese Writers: Self-Portrayals, ed. by Helmut Martin and Jeffrey C. Kinkley, (Armonk, NY: M.E. Sharpe, 1992. ISBN 9780873328173). ↑ Masaru Sato, 老舎作品における思想 (Lao She's philosophical perspectives in his works) (in Japanese). Retrieved December 20, 2008. ↑ Sato, . Retrieved December 20, 2008. Encyclopædia Britannica 2005 Ultimate Reference Suite DVD, "Lao She"
Sato, Masaru, 老舎作品における思想 (Lao She's philosophical perspectives in his works) (in Japanese). Retrieved December 20, 2008. Wang, Chi-Chen. Contemporary Chinese Stories. New York: Columbia University Press, 1944. This page was last modified on 21 June 2018, at 14:22.